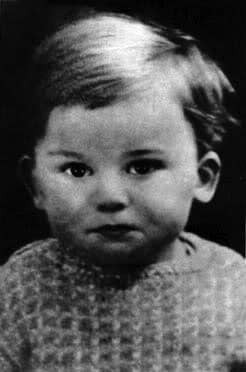 George Harrison was born on 25 February 1943 in a tiny 'two up, two down' house on Arnold Grove, a cul-de-sac in the Wavertree area of Liverpool. He was the youngest of four siblings, with a sister Louise (born 1931) and two brothers, Harry (1934) and Peter (1940). George's parents were Louise and Harold Harrison, Roman Catholics with Irish roots. His father was a bus conductor who had worked as a ship's steward on the White Star Line, and his mother was a shop assistant in Liverpool. I remember tiptoeing up the stairs to see him after he was born. All I could think of was that he looked remarkably like me. Some sources list George's birth date as 24 February, but his birth certificate specified the following day as the true date. The Harrisons lived at 12 Arnold Grove until 1950, when the family moved to 25 Upton Green in Liverpool's Speke area. George's first school was Dovedale Road, near to Penny Lane. Like Paul McCartney, he passed his 11 Plus exam and attained a place at the Liverpool Institute for Boys. He remained there from 1954 to 1959. A poor student, Harrison left school without any qualifications. He instead formed a skiffle group, The Rebels, with his brother Peter and a friend, Arthur Kelly. George himself insisted it was on the 24th. It seems he was born a few minutes before midnight. His father made a mistake and thought it was ten minutes after midnight. It was not. That’s why the documents say he was botn on the 25h. But he was not. I suspect that George was making mischief when he announced that his true birthday was the 24th of February. I have heard that he was born shortly after midnight daylight savings time on the 25th, which means that by normal time it would have been the 24th. Regardless, I continue to celebrate it on the 25the. Happy Birthday Mr. Who Cares We’re Just Cartoons! One possibility of George announcing his birthday being on the 24th could come from the fact that Britain during the second world war were an hour ahead and during the summer. In 1940 they didn’t turn back the clock and stayed an hour ahead. So through the war the UK was on GMT+1 time in winter and GMT+2 in summer. In 1943 DST started on April 4 and ended on August 15, which was “double” daylight savings time or 2 hours ahead of GMT. In 1945 the clock was advanced on April 2nd and then moved back twice on July 15 and October 7. This means that George was born at 11:10 pm on February 24th GMT, if we take his mother assertion that he was born 10 minutes past midnight (no reason not to) of what would have been GMT+1.